Our goal for now is to release a first preview of what we have accomplished. This release is mainly aimed at developers, testers and early adopters. It is not aimed at end users, and we do not recommend Linux distributions to package it as the default office suite yet. KOffice 2.0 will be useful for some users, but since it is the first release in a long series it is likely to contain bugs and incompatibilities. 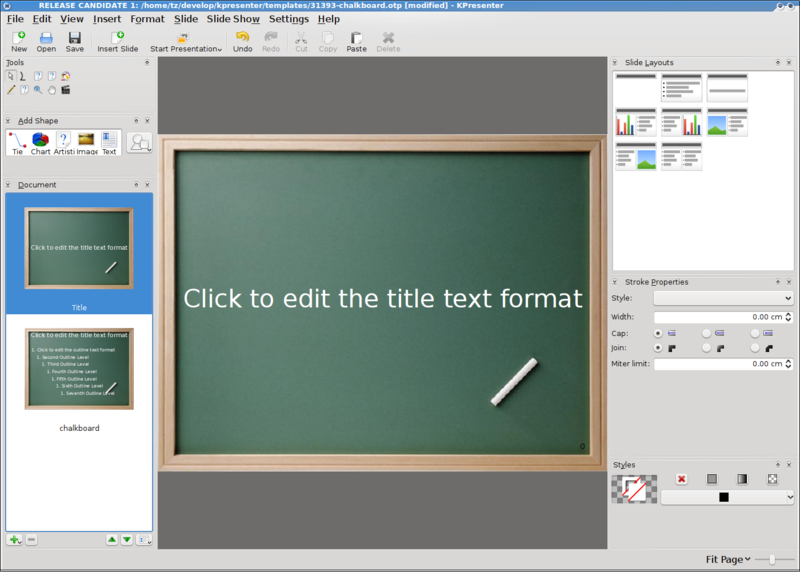 The chart application KChart is available as a shape plugin, which means that charts are available in all the KOffice applications in an integrated manner. The desktop database creator Kexi and the formula shape are aimed to be available in version 2.1. Kivio, the flowchart editor, is currently without maintainer and it is not certain when or if it will be released. 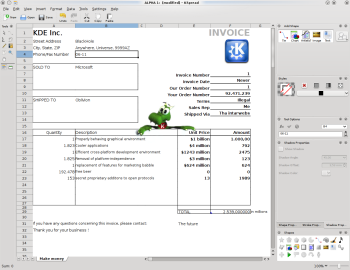 KOffice 2 is a much more flexible application suite than KOffice 1 ever was. The integration between the components is much stronger, with the revolutionary Flake Shapes as the central concept. A Flake Shape can be as simple as a square or a circle or as complex as a chart or a music score. With Flake, any KOffice application can handle any shape. For instance, KWord can embed bitmap graphics, Krita can embed vector graphics and Karbon can embed charts. This flexibility does not only give KOffice unprecedented integration, but also allows new applications to be created very easily. Such applications can e.g. target special user groups like kids or certain professions. All the applications of KOffice has a new GUI layout better suited to today's wider screens. The GUI consists of a workspace and a sidebar where tools can dock. Any tool can be ripped off to create its own window and later be redocked fo full flexibility. The users setup preferences are of course saved and reused the next time that KOffice is started. 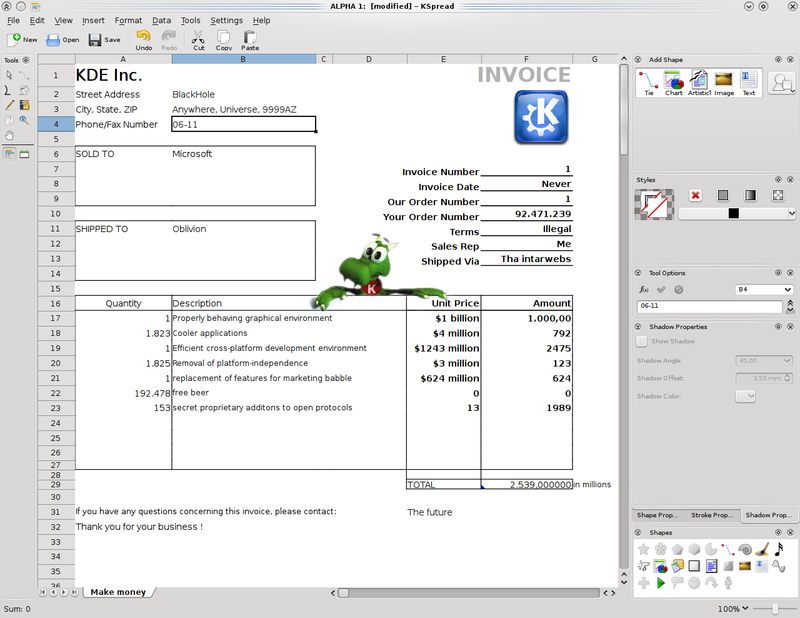 All of KOffice is available on Linux with KDE or GNOME, Windows and Macintosh. Solaris will follow shortly and we expect builds for other Unix versions to become available soon after the final release. It is possible that the release of binaries for Windows and Macintosh will occur after some time if other packages that KOffice depend on need more time. At the same time as the KOffice team releases its new version, there is also a new website designed by Alexandra Leisse. It features a new look, and is built on Wordpress. We hope that it will attract more people who are not developers so that we can build up a library of templates, add-ons, and user-generated documentation and tips-and-tricks. Congratulations on this release, I'm really looking forward to a wonderful KOffice 2.x series! Congratulations on getting KOffice 2 out! Does it support MS office compatibility now? I used Koffice 2 in beta stages and liked its simplicity and style alot. But it did not open MS office documents, which unfortunately many of my contacts,friends still use. That alone turned me off.. I hope its included now. No, KOffice does not have an MS Office filter and I'm fairly certain they are not planning one. As was stated, ODF is the file format KOffice has been built around. So they only solutions for MS compatibility are to either use Open Office, or find an ODF filter for MS Office and save to the ODF format. We do have import/export filters for many of the binary MS Office file formats -- .doc, .xls, .rtf. They're not perfect, but the .doc import filter got improved a lot during the past summer of code. Whether we'll ever have ooxml filters depends on a couple of things: whether Microsoft will ever support ooxml (they don't right now), whether someone will get interested in it and whether anyone will ever really use that file format. Congrats on a job well done. Hope you can now add all the missing parts including that scarce resource - developers! I too offer congratulations on the 2.0 release. I hope the developer's "KDE4" like strategy pays off and we begin to see rapid improvements (which is indeed happening with KDE4). I do have a question about dockers though. Whenever I start a KOffice app initially, the dockers are positioned similar to the above screenshot. However, whenever I select an object in one of the dockers (a flake shape for instance), the size of the docker changes to take up the majority of the docker space. Is there a way to force the docker size to remain the same? Big, fat congratulations. Your stuff is one of the prides of our developer community. Absolutely great. KOffice is not yet another Office B-production but an experimental lab for the future. This is a clear advantage of the open source model where developers can take the time to get it right and build an inspiring platform for the future. I just noticed that the icons of the application are incomplete. These small visual glitsches tend to undermine the experience of users and will built a groundswell in interest to see them fixed. At work, this is critical -- at least until ODF file format becomes more prevalent for business documents. I could not open any of my word documents at work. I could open spreadsheet but formulas didn't show up. I know this is a developer-only release. So, this is probably a feedback for devs rather than a rant at KOffice! Nice jobs getting koffice 2.0 out you guys. Well, we take the MS ODF formula namespace into account at least; kspread isn't surprised by those. Whether the formula's work, I don't know. Although i have never had a look at the source code of KOffice, i have the feeling that this is the office suite with the cleanest and most flexible code base, because it is written in an object-oriented programming language with reuse of components as a top priority. Also it uses the KDE libraries and Qt which also make the impression of being designed very well. Congratulations to the developers! This is great work! Tables are not yet implemented in KWord, because of lack of time. You're depleting my Paypal account. If you continue releasing quality software like this I'll have to put more money into it YET AGAIN. Thanks for the software. I love you guys and gals for it. Thanks, to you and all the others that commented.